This letter folding mirror comes in black and white. It closes nicely allowing for easy portability. 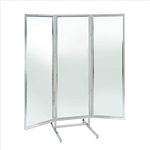 Countertop Mirrors are a great addition to any display.